When beginning the work of designing a complete curriculum for the early years, Mary, Matushka Emily and I began by taking into consideration the context of family life, the loving atmosphere in which the child will be learning. The balancing act of juggling multiple curriculums can be daunting. Unless a curriculum is designed for the reality of the home environment, in relation to time and focused attention from the parent, the task can prove itself to be frustrating at best and at its worst, impossible. For this reason we have laid out one cohesive curriculum, purposed to span multiple ages, from a precocious three-year old to a nine-year old in need of additional phonics instruction. 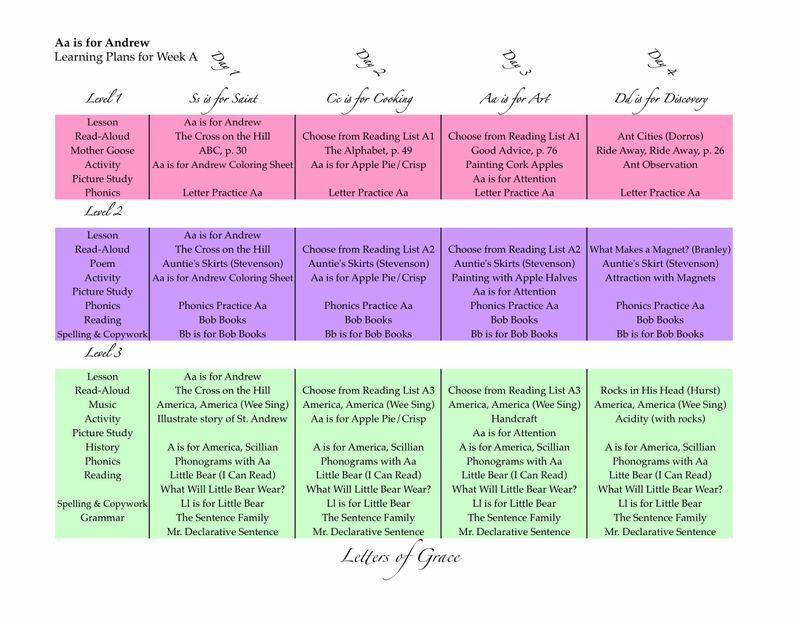 Each aspect of Letters of Grace includes three distinct skill levels of learning concentrated on similarly themed subject matter. From simple letter recognition to advanced phonogram study and introductory grammar, the three-tiered approach accommodates a family with many young children as well as the entire early education of one child. 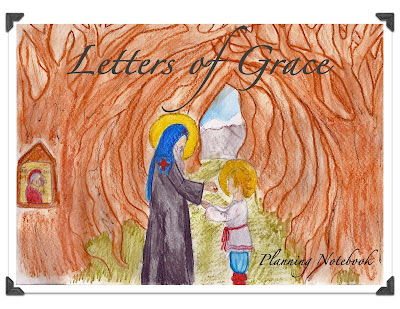 Each time a child begins a new year of Letters of Grace, a unique learning experience will be encountered. We begin each week with a clearly laid out plan. A color-coded, all-in-one page view will be available for download and printing for each week of the plans. 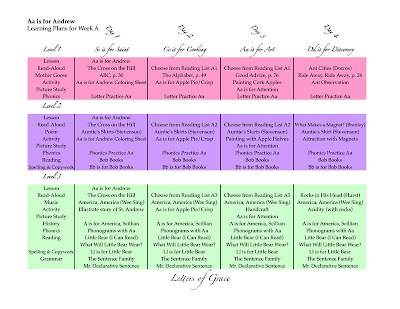 No matter the number of children using the curriculum and regardless of the span of their ages, all of the plans for the week are neatly laid out on one sheet. A page of lesson notes, offering more detailed explanations of the week's lessons, insights and helpful tips will accompany the lesson planning chart. 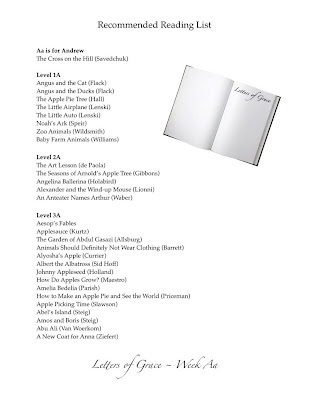 The weekly pages will be completed with a weekly book list organized by suggested reading level and alphabetized by author, along with a weekly supply list. We hope these lists help the teaching parent to gather books and supplies ahead of time, alleviating the need for last minute list-making and frantic scrambling for resources. 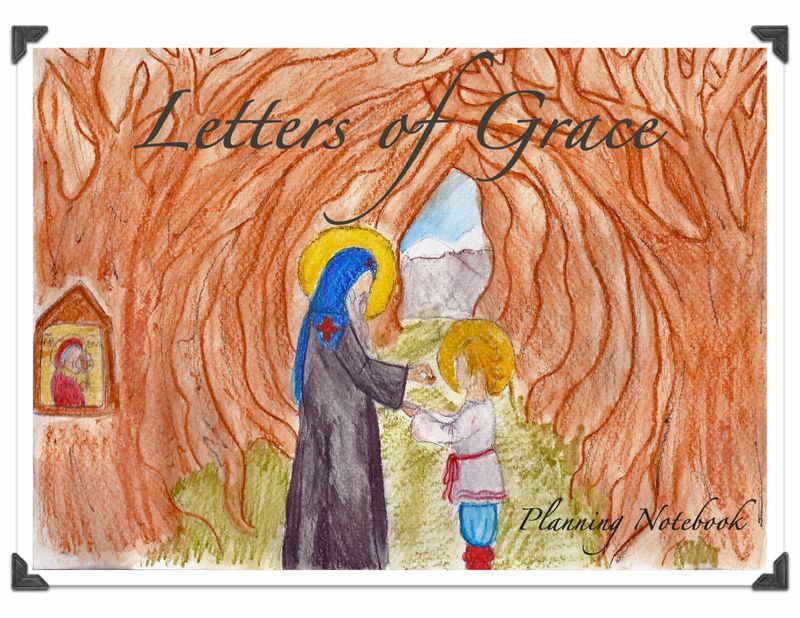 All of the planning resources for Letters of Grace will be offered as PDFs. Since we cannot control the availability or longevity of outside web sources, the curriculum does not depend in any way on internet links. For this reason, Letters of Grace is unique. Countless hours have been spent attentively customizing the resources for each week of plans. Every activity, recipe and project has been carefully worded, mother-to-mother, and beautifully presented to be used within the context of a family's daily life. Step-by-step instructions will be offered for setting up the parent's planning notebook as well as the child's learning notebook. 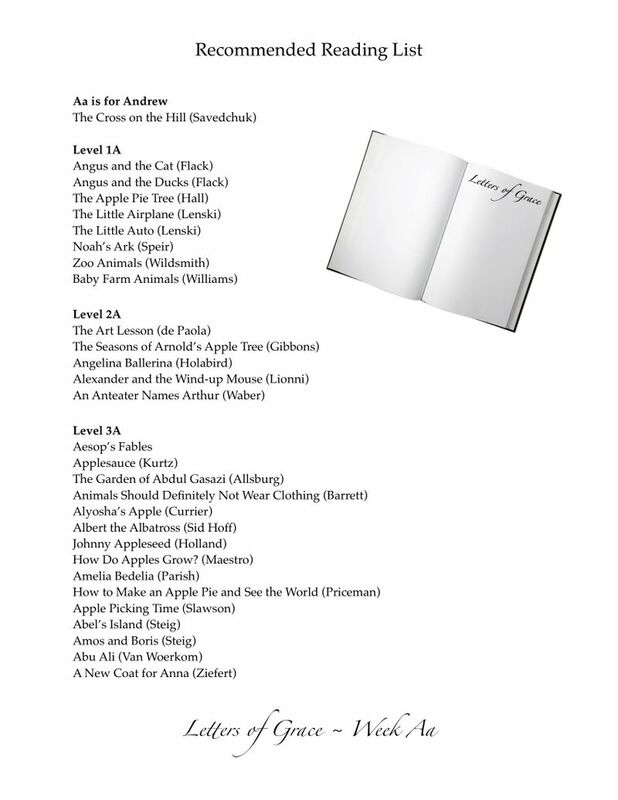 A clearly labeled cover page with original artwork and a table of contents will be available for download and printing. The only thing necessary to purchase will be a 3-ring binder with a clear pocket cover and a set of alphabetical index dividers at your local office supply store. All planning pages and resources will be conveniently filed behind the alphabetical tabs. Once the notebooks are set up with the printed resources, there will be no pressing need to return to the computer to use the plans. With your notebook and library card, you're ready to go. The next post in this series will begin a guided tour of the planning chart previewed here. We will begin with Ss is for Saint. In the meantime, please feel free to leave any questions in the comment box or send them via email. We plan to collect the questions and answer them in a single post after the tour of Letters of Grace is complete.